At this point, I think we can all agree that I have just a little bit of a polka dot obsession. I have too many items with the pattern, and I am fully aware that I need to stop buying pieces of clothing with it. Of course, if someone were to say, gift me a polka dotted item, I would have to generously accept it, wouldn't I? It's pretty well-known that Lisa of Lala Faux Bois is great (I met her in person in May, so I know this for a fact), but she proved it once again by sending me this lovely dress recently. I was a little confused when I opened a package from her and not only found a piece of her's that I had asked to borrow (which you'll see on Wednesday), but another item in there as well. Had I asked to borrow something else and just had forgotten about it? No, Lisa is just wonderful. 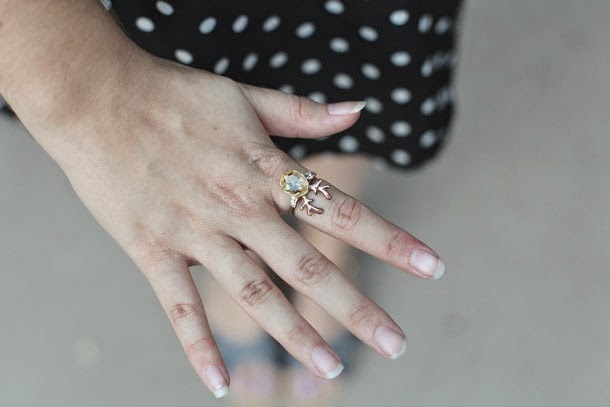 Turns out, someone had gifted it to her, and since she already owns something just like it and knows I love polka dots, she thought I should have it. And yes, I also own something exactly like it, but it would be rude of me not to keep it. Well, at least that's what I'm telling myself. So, as previously mentioned, the most exciting thing to happen to me since my last post is a thing that I am absolutely giddy about, but most of you won't care about it at all. Quick recap of the event again: Dan Harmon is the creator of the TV shows "Community" and "Rick and Morty." Harmon got fired from "Community" for one season before he was hired back, and during his time unemployed, he took his podcast, "Harmontown," on the road to 20 cities while a documentary crew filmed it. On Thursday, I attending an LA screening of the documentary, also called "Harmontown," which was followed by a Q&A and a podcast taping. Not only was the documentary incredible (it's a seriously well-made piece of film that can be enjoyed even if you're unfamiliar with Harmon or his podcast), but everything after was as well, especially since I got to actually meet and take a photo with Harmon. He was extremely nice, and he stayed in the lobby after until every fan had gotten the chance to take a picture with him and talk to him. "Community" has been such a big part of my life since it first aired, so to get to meet the man behind it was thrilling for me. As an added bonus, I also got to meet Kumail Nanjiani, who moderated the Q&A and whom I'm a huge fan of. I pretty much love everything he does — he's a main character HBO's amazing "Silicon Valley," his stand-up is hilarious (watch his special, Beta Male), his weekly stand-up show turned Comedy Central show with Jonah Ray ("The Meltdown") is fantastic, and most importantly, I'm a giant fan of his podcast, "The X-Files Files." Yes, it's exactly what it sounds like. We actually saw Nanjiani out on the street before the show, but I was too nervous to approach him because I'm a wuss. Fortunately, my friend Adam stopped him for me after the show, and I got to tell him how much I love his podcast and take a picture with him. I totally understand that these a very obscure celebrities who most of you don't care about as much as I do, but oh, well. This was a pretty big deal for me. The rest of the weekend wasn't nearly as exciting, but still great. I got to catch up with my friend Patty on Saturday afternoon, and then went to a local brewery with my friends Adam, Jon, and Miller later that night. I've been pretty sad because all of my friends in Illinois who graduated went back to our old campus for the weekend to visit with our friends still there, so I'm happy I got to stay busy and distracted while I was thousands of miles away. I did get plenty of calls and texts from them, though, so at least I know they haven't forgotten me. Who DOESN'T love polka dots, I ask you? 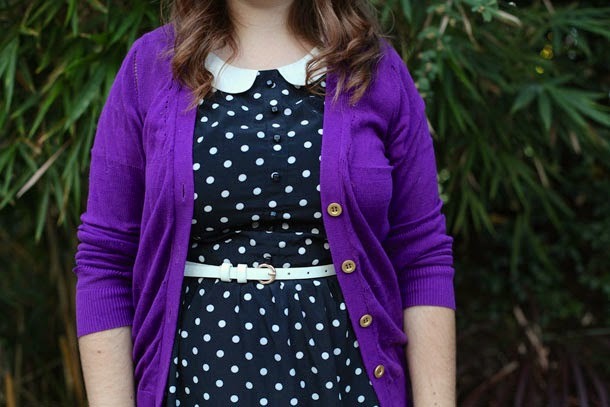 This dress is adorable, and I love the purple cardigan you've paired with it. Lisa is such a sweetie. That dress is just PERFECT. 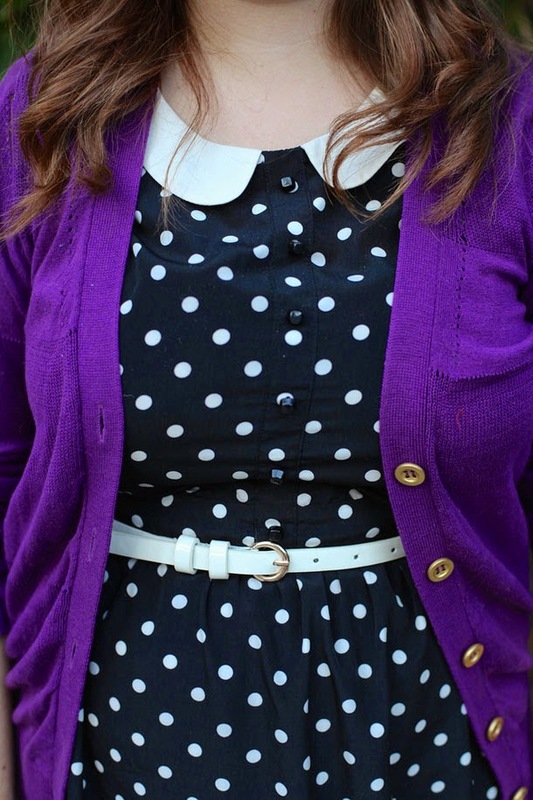 Polka dot and a Peter Pan collar? Lush! What a brilliant gift to find! You're not alone in your obsession!! I love polka dots! They're cute and fun and a bit spunky! You look lovely in this dress! In high school, I was seriously obsessed with wearing polka dots but during college I decided I hated them and totally purged my closet. But I think it's time to bring them back, I loooove this outfit! I love this dress on you! 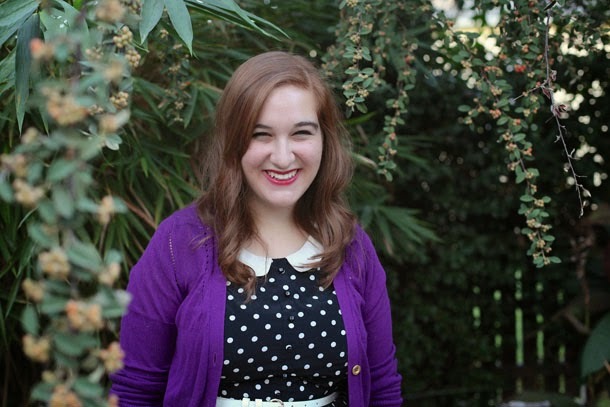 And it looks lovely paired with your purple sweater (: by the way, your hair looks really beautiful in these photos! 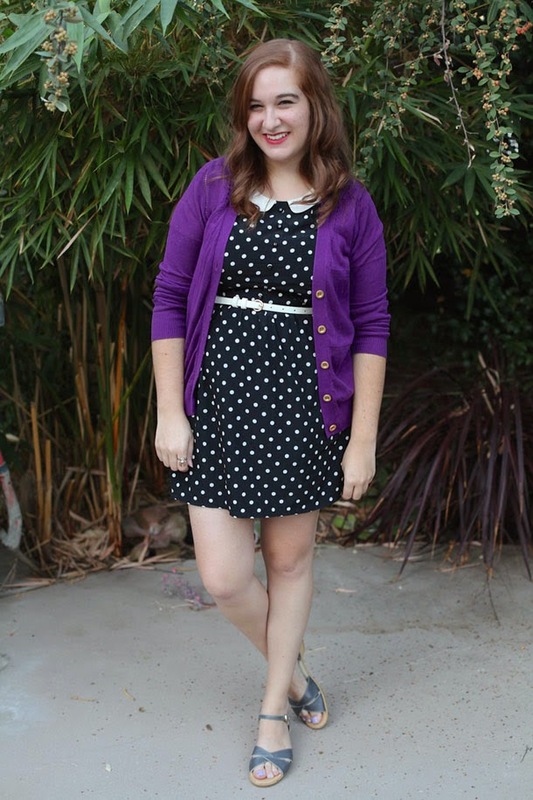 There ain't nothing wrong with a few polka dots (or a lot) - they're just so darn cute! I don't watch Community, so I don't know who that is, but I do know how exciting it is to meet someone that you idolize like that. I met some celebrity chefs in the summer and was completely stoked! This is such a cute post! Date nights really are so important! I have the same problem with polka dots. I was packing my duffle bag the other week for a long weekend, and I subconsciously put everything that was polka dot inside of it. Lol. I'm so glad you had fun at the documentary and Q&A. A few different friends tried to get me into Community, but I don't think I'm ready yet. I binge watch too many shows as it is. Ah yes, the good old polka dot print, I can totally see why you wear it, you rock the dots! This dress fits you like a dream and I won't stop being jealous of all of this. Next time kiss someone for me or at least tell me you did. But seriously, this dress is the best, ever. 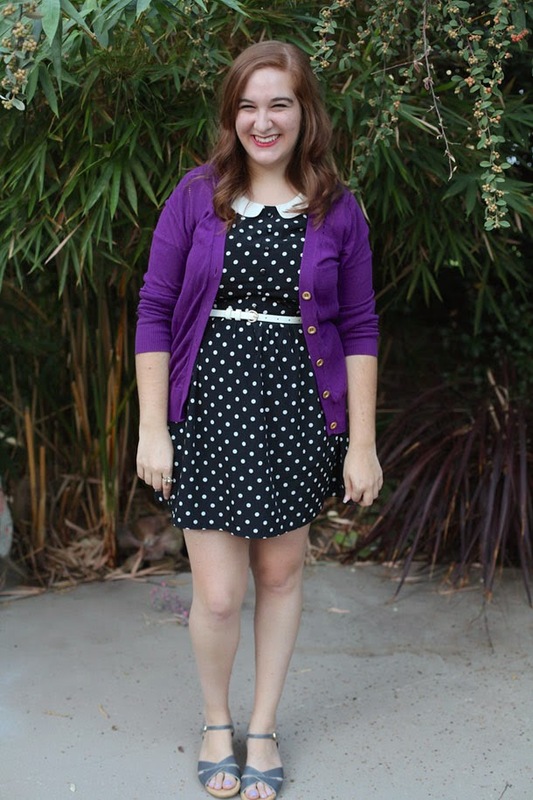 Polka dots and purple are a surprisingly really great combo. Not that I thought they wouldn't go together but there's a sense of.. I dunno. Energy with the combo. It's so cool that you got to meet Dan Harmon! I really love Community, and my husband would totally geek out over your meeting -- he's always looking up writers and listening to podcasts and keeping up to date on all of that. And I love this dress and your whole outfit! You look so, so pretty. Also, you have gorgeous hands (I always notice hands).